Forget your regular Tuesday morning plans, because Spike TV is hurtling you into the future of tech with their exclusive live coverage of the 2012 Consumer Electronics Show, brought to you directly from Mount e-Lympus (a.k.a. the Vegas strip) along with an army of Booth Babes, ready to seduce you with something far more current than an AOL-dial-up-tone siren song. 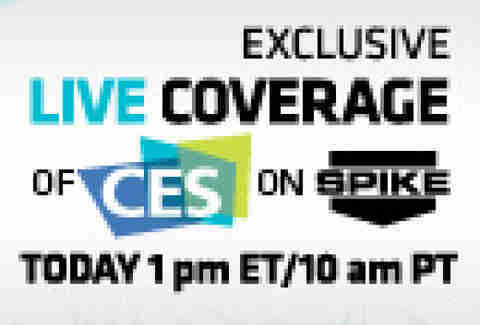 Spike TV, the official broadcaster of CES, brings you full-blown, behind-the-scenes access to the largest and most important technology event in the world. You'll score five hours of product premieres, exclusive demos, and CEO interviews, all brought to you by Spike's team of experts, including video game journalist Geoff Keighley and Internet celebrity iJustine, as well as celebrity ambassador Eliza Dushku. And because there ain't no party like a high-tech party, your TV will also be graced with a VIP pass to Spike's CES party for the post tech-vention festivities. But if advanced technology gives your TV an inferiority complex, catch the broadcast online at Spike.com, or on your Android, iPhone, or iPad -- not to mention giant video screens in Times Square. It's not every day you get to hobnob with 16-bit Italian plumbers and eccentric Silicon Valley billionaires, so make sure to tune into Spike TV's four-hour live CES coverage today at 1p ET/10a PT and tune back in at 11p PT for a VIP pass to Spike's CES party at Tryst Nightclub at Wynn Las Vegas.